The LingvoSoft Tagalog Platinum Pack is a superb collection of LingvoSoft software featuring the Tagalog language. It equips you with advanced applications for all the devices you have now or will have in the future. If you are a student of languages, a businessperson dealing with Tagalog partners, or a frequent traveler to the , this comprehensive package will cover your needs in a convenient and cost-efficient way. 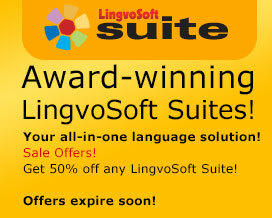 A unique combination of award-winning titles that make using a second language easier than ever before, LingvoSoft suites bring together the most popular and useful applications we have to offer in a single collection. 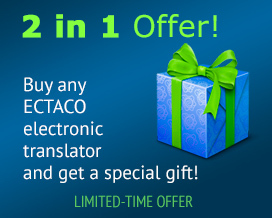 A global solution for your desktop or laptop PC, they deliver enhanced language management and translation functionality you can count on and are completely Windows 10 ready. The perfect all-in-one travel solution, LingvoSoft Travel Suite LanguageName <-> LangName for Windows Mobile provides everything needed to make business travel more successful and leisure travel more enjoyable. A unique combination of speech-enabled translating dictionary , a talking travel phrasebook , this resource for Windows Mobile delivers practical information you can count on when visiting another country. LingvoSoft Talking Dictionary English <-> Tagalog (Filipino) for Windows is part of LingvoSoft Suite - the complete language solution available only from LingvoSoft. First choice at home, at school or at work, LingvoSoft Dictionary provides instant bilingual translations that can be voiced aloud using the latest TTS (text-to-speech) functionality, delivering accuracy you can depend on time and again. LingvoSoft Talking Dictionary English <-> Tagalog (Filipino) for Windows Mobile is part of LingvoSoft Suite - the complete language solution available only from LingvoSoft. Created by our award-winning team of programmers and linguists, the new Talking Dictionary is first choice for Windows Mobile users who demand the best wherever they go. LingvoSoft Learning Voice PhraseBook English <-> Tagalog (Filipino) for Windows is part of LingvoSoft Suite - the complete language solution available only from LingvoSoft. With thousands of practical and useful phrases now at your fingertips, learning another language is easier than ever before. LingvoSoft Talking PhraseBook English <-> Tagalog (Filipino) for Windows Mobile is part of LingvoSoft Suite - the complete language solution available only from LingvoSoft. Communicating in another language is easier than ever before with thousands of practical and useful phrases now in the palm of your hand. LingvoSoft FlashCards English <-> Tagalog (Filipino) for Windows is part of LingvoSoft Suite - the complete language solution available only from LingvoSoft. Now it easier than ever to learn new words, increase confidence and speak like a real native in no time at all. The intelligent way to make learning another language fun, LingvoSoft FlashCards are the number one choice of millions of satisfied language learners around the world! LingvoSoft FlashCards English <-> Tagalog (Filipino) for Windows Mobile is part of LingvoSoft Suite - the complete language solution available only from LingvoSoft. Now it is simpler than ever before to improve your vocabulary and learn thousands of new words no matter where you are – at home, at school, or even at work. FlashCards make learning fun and let you use any free time to build your language skills and increase confidence.